I’ve just received a preliminary report on the UUA’s Youth Summit (the culmination of the Ministry To and With Youth process) from my colleague in the Central Midwest District, Dori Davenport. The gist of Dori’s report is this: “At the end of our five day Summit, we came away with one overarching theme: We ask for a fundamental shift in Unitarian Universalism–a shift to a multigenerational, congregation-based youth ministry in which youth ministry is central to the articulated mission of the UUA.” To which I say, Whoo-hoo! This is good stuff, and I agree with it whole-heartedly. Multigenerational, congregation-based youth ministry–yes! Youth ministry central to our mission–yes! I’m going to be blogging more on this over the next few weeks, specifically about what I consider to be one of the more useful approaches to youth ministry these days. 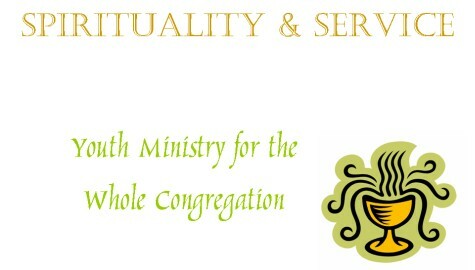 It’s an adaption of the Youth Ministry & Spirituality Project that I’m calling “Spirituality & Service: Youth Ministry for the Whole Congregation.” Stay tuned…. As part of his Tips on Creating a More Connected Life, Edward M. Hallowell, M.D. suggests that we “visit the grave sites of loved ones every year.” He says that “this provides a time and place for remembering and reconnecting with the past.” So as part of our trip back to Indiana this summer, Julia and I have been doing exactly that. 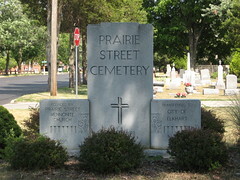 This picture is of the Prairie Street Cemetery, which was donated by the Prairie Street Mennonite Church to the City of Elkhart, and it happens to be the place where my father’s parents are buried. I wasn’t sure exactly where their grave sites were, since it’s been over twenty-five years since their funerals. But I had some vague recollection, and sure enough, I found them. I made this visitation on my own, but Julia and I did take Henry David to Julia’s mother’s grave site in Goshen, and we’ll stop by the memorial garden at the Presbyterian church in Elkhart where my father’s ashes are interred. I’d like to visit my maternal grandparents’ sites, too, but we may not have time this trip. We also made a quick excursion up to East Lansing, Michigan, where my best buddy from theological school is the minister. Kathryn’s doing a wonderful job with the congregation there, and it was great to see her and her family–husband Stuart and son Theo (and poodle Scotty). Stuart and Theo spent Saturday morning working at a Habitat for Humanity site in Lansing with some other volunteers from the church, so we stopped by to see how it was going. It was wonderful to see quite a few youth from the church working along side the adults. Habitat is a natural volunteer opportunity for our any congregation. It can be completely intergenerational, too. The East Lansing church has the younger children come on the day when the keys are turned over to the new owners so they can be part of the celebration! I’m heading to the Hoosier State with Julia and Henry David at the moment, but before I got too carried away with my vacation time, I thought I’d do a quick post about the the latest photos I’ve added to my flickr page. They’re from the Healthy Congregations training I was part of over the weekend, which took place at my home church: Unity Church-Unitarian. After being away so much last summer, I promised Julia that I wouldn’t do anything “extra” this year. But since this training was in St. Paul, and since it was based on family systems theory (one of my favorite subjects), I couldn’t resist. What was especially nice about this training was that the trainers were district staff members themselves, Connie Goodbread and Richard Speck. Even better, a lot of my district staff colleagues were there, too. But the really great thing was the UU perspective on the Healthy Congregations model. 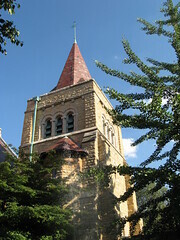 Connie and Richard have done a terrific job of adapting the Christian elements for Unitarian Universalist congregations. I’m looking forward to working with Nancy Heege and Cheri Cody (a Prairie Star district volunteer who was at the training, too) as we bring these learnings to our congregations. I know it’s a little late for this year’s celebration, but I think it would be great if congregational leaders could have material similar to the Tikkun stuff available for families to use on their own, material that put the holiday in a liberal religious/spiritual progressive perspective. Even better, congregations could plan to hold thier own Fourth of July celebrations. The idea of summertime being downtime in our religious communities is due for some serious reconsideration. Just because 19th century Bostonians needed to beat the heat and escape to Maine in the summertime doesn’t mean we should continue the practice. Helping families live their liberal faith on a daily basis is a 24/7/365 obligation. That doesn’t mean religious professionals need to be on duty all the time, but we need to constantly be using the technology available to us (like blogs) to share our faith and strengthen our families.